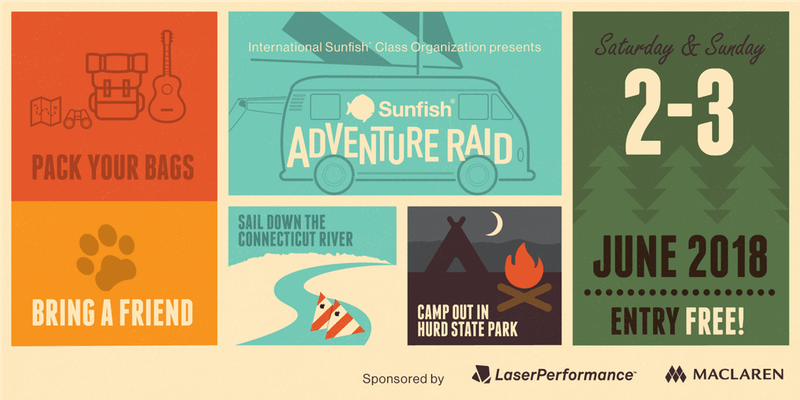 this will be the 2nd annual Sunfish Adventure Raid – Laser Performance is again sponsoring a 2-day sailing event on the lower Connecticut River near Hartford this summer. Mark your calendars for the 2nd Annual Sunfish Adventure Raid! 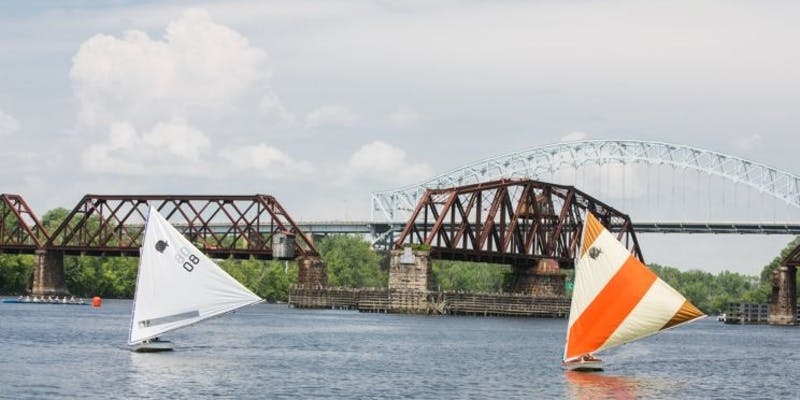 On the weekend of June 1st 2019, join sponsors LaserPerformance and Maclaren, in Hartford, CT USA for a two-day distance sail down the Connecticut River to Essex, CT. Races on Saturday will be followed with a regatta camp out in Hurd State Park with a barbeque provided by LaserPerformance. Racing continues down the river on Sunday to Pettipaug Yacht Club for post-race festivities for sailors and friends! Join us for a two-day fun race following the lower Connecticut River from the industrial banks of Hartford, past meadowlands and wetlands, meandering past eighteenth-century seaports, to finish at tree-covered Essex. Up to two people sail per boat, carrying on board the necessary camping gear (tents, sleeping bags), life jackets, clothing and foul-weather gear, lunch and drinks for two days. Register for two days of family fun and adventure! sign up/registration information can be found here. additional details can be found at LP’s Facebook page for the event. this event has been held annually for the last several years, but had been mainly initiated and organized by just a few Sunfish enthusiasts. it’s nice to see Laser Performance sponsoring the race again this year, and hopefully they will continue that sponsorship for future years. Enthusiasts have been known to enjoy offshore cruising in, and overnight camping from, Sunfish, and have used them on river trips. Every May a fleet of about 100 of the little boats participates in a three-day race down the Connecticut River from Hartford to Essex. I’m not sure that any of the recent events have come close to that many participants, but perhaps with LP acting as a sponsor, it will help create more interest in getting this back as a Sunfish tradition. Laser Performance is sponsoring a 2-day sailing event on the lower Connecticut River near Hartford this summer. Rig your Sunfish or any boat that can be beached (daggerboard/centerboard), pack your sleeping bags, and grab a friend!! After hearing from the sailors, ISCO has revived the Sunfish Adventure Classic and, transformed it into an annual roaming event for the Sunfish fleet to take any shore. To be known as the Sunfish Adventure Raid, ISCO is proud to host its first regatta. Join us for a two-day fun race following the lower Connecticut River from the industrial banks of Hartford, past meadowlands and wetlands, meandering past eighteenth-century seaports, to finish at tree-covered Essex. Up to two people sail per boat, carrying on board the necessary camping gear (tents, sleeping bags), life jackets, clothing and foul-weather gear, lunch and drinks for two days. LaserPerformance provides the food, drink, and staff for the Saturday night cookout and a complete breakfast Sunday, as well as a post race party! Register for two days of family fun and adventure! this event has been held annually for the last several years, but had been mainly initiated and organized by just a few Sunfish enthusiasts. it’s nice to see Laser Performance sponsoring the race this year, and hopefully they will continue that sponsorship for future years. the Sunfish Class has posted the NOR and information about the 2017 Sunfish North American Championship: this year it will be hosted by the Sayville Yacht Club in Blue Point, New York. 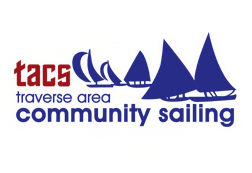 Sayville Yacht Club is pretty close to the Wet Pants Sailing Association, so I’m sure Sunfish sailors from WPSA will be there in full force. the Sunfish Class has announced a new ISCA president, Larry Mass. the previous president, Paul-Jon Patin, will continue to be involved as the out-going ISCA President. the new President Mass has issued a letter from the President that was posted on the Sunfish class website. The 46th Sunfish Youth and World Championships held in Cartagena, Colombia, are now complete. Congratulations to Angelo Giuria of Peru, the Sunfish Youth World Champion, and to Alonso Collantes of Peru, the 2016 Sunfish World Champion. Sailing conditions were challenging due to Hurricane Otto producing light winds and 10-15 foot swells. Thirty-six (36) competitors from eight (8) different countries competed in the Sunfish Youth World Championship. Notably missing were youth competitors from the U.S. We all need to work on getting more youth involved and interested in participating in as many of our major events as possible. The Sunfish World Championship, with 63 participants, was well-represented with competitors from 15 different countries — a very impressive showing that we hope to continue. Last but not least, I want to thank Paul-Jon Patin who quickly secured the last 24 U.S. made boats before boat production was moved to China in the first quarter of the year. This move ensured that we had at least 24 new boats for the World Championships in the event the production facility in China was not up and running in time. Paul-Jon also traveled to China to test the boats earlier this year and to give some technical advice to Laser-Performance (LP) and the factory. While the verdict is not yet out on the new boat production facility in China, I can say that seven of the top 10 boats in this year’s World Championships were Chinese made boats. The winning boat Alonso Collantes sailed in Cartagena was a Chinese made boat. 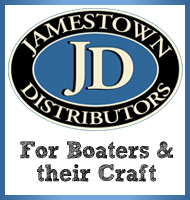 Maintaining quality control and availability of parts and boats are a number 1 priority for me. I am currently working with Laser-Performance to address many of these issues. We have the next four World Championships now scheduled! Next year’s World Championships are scheduled for August in Brant Beach, NJ. In 2018 the World Championships will return to North Carolina and my home Yacht Club, Carolina Yacht Club, in Wrightsville Beach, NC. This is the second oldest yacht club in the United States. And this is a fantastic ocean venue. Next in 2019 Bonaire will host the World Championships. Lastly in 2020 we will sail in Martinique which will be the 50th Sunfish World Championships. for more information and details, see the News page at the Sunfish Class website. the Sunfish Class sent out an email blast for the upcoming Harkers Island Sunfish Regatta (July 15-17) in North Carolina. I’ve seen pics and such for the event before – it looks like a neat and fun weekend! If you’ve been thinking about making it down to North Carolina for a Harkers Island Regatta, this would be a good year to hit the road for our 15th annual running and extended party weekend July 15-17. Checkout a short aerial video clip. More details about the regatta and Harkers Island are on the MOBYC website. The three-day event kicks-off Friday noon with a practice sail around the island and dinner party with crab races, blender sports bar and a one-man Caribbean loop jam band. Saturday is the 10+ mile race around the island followed by a low-country boil dinner complete with steamed clam appetizers, video replay of race highlights, rum cake dessert contest, awards and complimentary Gosling’s Dark & Stormy bar. 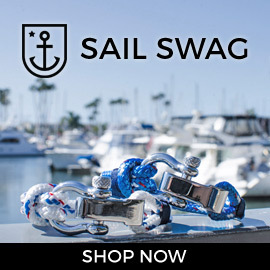 Sunday winds up with short course racing and Sunfish/boating gear prizes. All proceeds to benefit local NC youth sailing programs. Camping and some housing available in addition to inexpensive hotels. NOR is posted on the class website. Expecting to break the 60 boat barrier this year. Checkout a short aerial video clip. the renowned Sunfish sailor Derrick Fries has been collecting data about his sailboat racing for almost 50 years, logging information for his upwind legs and his starts at all of his sailboat races. the amount of data compiled is a bit mind-numbing, to be honest, even for a numbers guy like myself. sure, maybe the number itself isn’t that staggering, but holy smokes that’s a lot of races sailed in a lifetime. The result is a huge statistical set: 10,000 windward legs and more than 3,700 starts. Derrick has written an article discussing his data-logging and research with it for Sailing World – check out the full article here: First-Beat Cheat Sheet. So conventional wisdom suggests that, all else being equal, you should start at the pin end. My data quantifies that assumption. Of the 3,727 starts in my data bank, 2,646 of them were pin-end-favored — a whopping 71 percent of the time. I’ve written previously about Derrick Fries here. Derrick is a Sunfish champion and author of “Successful Sunfish Racing” and “Start Sailing Right“. a very nice video about the world’s longest Sunfish race – sailing around New York’s Shelter Island.